My wife and I just got back from a 3 day fishing trip at Flag Island Resort. Dan and Kiok are great hosts and we had another awesome time. Dan put us on walleye, crappie and Jumbo perch. We got to the crappie spot a little late but group that was ther before us hauled in their limit of 12-15" fish. We managed 12 but had to work for them. One of the walleye spots we were on was so hot you could barely get your line to bottom before fish would take it. We lost count as to how many fish we actually caught. Limits were no problem and the keepers were in the 16-18" range. Jumbo perch were in that 12" +/- class. We were going to try for Lake Trout but ran out of time. We have a lot of fun snow catting from spot to spot and the scenery was breath taking. Here are some pics of the trip. Walleye in pic was a 24" I got. I would highly recommend a sled and a portable to get around best. great pics! 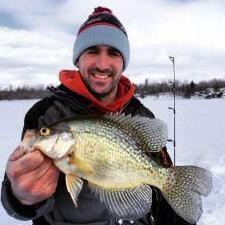 this makes me want to make the trip even more...did you find the crappies on the U.S. or Canada side? It's a great destination. Crappies are on the canada side. Pretty much the same with Rainy Lake too. Awesome, we are booked to go up and fish with Dan March 12-15. It will be my first time up there in the winter. My buddy told me to fish the same spots I do in the summer, sound like good advice? Thanks for making the wait even worse. how much does a canadian license cost? are they week licenses? can you get a season long license? Great report UGUIDE! I am headed up to the same resort next week. Do you have any advice for me on those crappies??? Where did you buy your Canadian License? I was thinking of using Gulp Alive maggots and waxies for the crappies. Walleyes seem to like spoon and emerald shiners from what I hear. Any advice you can give is greatly appreciated. Tully, happy to help you with the wait. ;> Those summer spots are worth a try but I'll have to defer to Dan on the expertise since I don't have that much. Good luck and let us know how you made out. We paid about $23 for a 8 day canadian conservation license. I think the regular is about $40 and basically aloows you to take a few more fish. I think you can get a season long license. I think you are right on with the bait strategy. We we going to try some gulp maggots as we have had luck on Rainy with them and Crappies. We forgot them in the "other" tackle box. We used emerald shiners (frozen) and spoons (white frosties). We got our licenses at the Shell station in Sprague right after you go through customs. Bring cash because that's all he takes on the license sales. Good luck and send a report back.